The moment you have all been waiting for is here. The votes are in and a huge thanks to all bloggers and voters who participated. I am thrilled by the way everyone came together to celebrate and support the talented individuals who spend so many hours behind the scenes creating the blogs we all love to read. Without further delay, I am more than pleased to announce the winners of the NEPALIAUSTRALIAN’s Blog Award 2013. Good luck to everyone who has been nominated. Big Congratulation to all the winners, do not forget to leave your acceptance speech 🙂 and thank you everyone. This entry was posted in Nepaliaustralian Blog Awards and tagged Best Blog Design 2013, Best Blog for 2013, Best Blog Post of the Year 2013, Best Fashion Blog 2013, Best Fashion Blog Post 2013, Best Food Blog 2013, Best New Blog 2013, Best Personal Blog 2013, Best Photo Blog 2013, Best Photo Blog Post 2013, Best Travel Blog 2013, blog award, blog awards, Blog Design, Blog Post, Fashion Blog, Most Diverse Blog 2013, Most Educational Blog Post 2013, Most Witty Blog Post 2013, Nepaliaustralian Blog Awards, Nepaliaustralian Blog Awards and tagged awards, Nepaliaustralian's Blog Awards, personal blog. Bookmark the permalink. You guys have a great blog and hope you don’t stop blogging. Congrats to all the winners…and thank you so very much for the nomination nepaliaustralian! Thank you everyone. 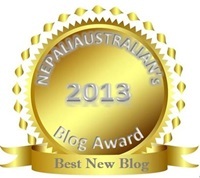 I m honored.Thank you Nepaliaustralian for coming up with this blog award. You are welcome and you deserve the award :). You have great readers who voted for you, keep blogging. Loved this selection, I want to join the 2014 process 🙂 How do I do it? Welcome to my blog. Please keep reading my blog, I will do this award for 2014 at the end of the year again. Thank you, thank you, thank you! I am so grateful and amazed at the wonderful readers I have! You guys seriously make me blush. Thank you Nepaliaustralian for coming up with the blog award and recognizing your fellow bloggers. You are the one who deserves the greatest blog award of all! A big thanks to nepaliaustralian for all the trouble you went through to organize everything! Thank you everyone who voted and all for your support! I really appreciate it. Best Photo Blog Post 2013. I really appreciate it. Many Many Congratulation to all the winners !! I am so thrilled for being selected “Best Fashion Blog 2013”!!!! I want to thank everyone that made this happen, it is such a boost of morale, thank you for voting me, i really appreciate it! And not least , a big thank you to nepaliaustralian for all the trouble you went through to organize everything! Thank you for your support! Thank you!!!!!!!!!!!!!!!!!!!! I am thrilled!!!!!!!!!!! Congratulations to all the winners! You are all so very deserving. Thank you to all who voted for us – thank you so much. It is a huge honour to be recognized in this way. Thank you nepaliaustralian for all your efforts in creating and running these awards – a huge amount of work I’m sure. Wow, thank you so much! I feel so honoured! Congrats to everyone who won and hats off to them who didn’t . Thank you for motivation to keep on writing . in uppercase, i intend to shout from the mangrove treetops here in ecuador, THANK YOU THANK YOU THANK YOU!!! I’m honored and humbled and flattered that my posts have given you this much pleasure. the nocturnal birds on the river are the only ones i can share this with at this late-night moment, but i am going to go to the deck and share this honor via whisper to the birds and the waxing moon!